One thing I want to tell you, one other thing. Uh, this is really true. There’s one other thing. Before I, uh, start the message, is I want to let you know that we’ve been in the process of evaluating everything that we’ve been doing around here, uh, for several months now. It started last fall, at our elders’ retreat. And we’re in dynamic growth at Gateway Church. We have been growing dynamically for years and years and it, it hasn’t stopped at all. And we felt like the Lord spoke to us on the retreat last fall, that this growth is going to continue. We’ve looked at all of our positions, we’ve looked at all paid staff, we’ve looked at all volunteers, we’ve um, looked at all of our processes, uh, and we’ve come to the conclusion that we need to make some changes, in how we do things. So we could do things, uh, better. And not be as “busy” maybe as we are, so you’ve got more time to minister to people, be with your family, and yet still be equipped. And so, we met with, again, every person on staff. And our meetings have been fantastic. We have the best staff in the world. I mean, we have, phenomenal–if you’ve dealt with our staff, I think you know what I mean. And then also as we went through this, some positions, we realized, are not needed any more. And so we’re going through about a 15 to 20% reduction in staff. And I wanted you to know that, so that if you hear something, you’ll know why. We’re trying to do what God’s called us to do, more efficiently, and we’re also trying to prepare for the growth that we have in future, and cause that growth to be sustainable. So um, our growth is– our attendance is up, our giving is up, uh, every- the church is doing well, but we decided we’ve got to make some changes. So here’s what I want to ask you to do. I want to ask you to pray for these–our staff, the part of our staff that’s going to go through a transition. Many of you have been through a transition. The great thing about being a child of God, and going through a transition, is that God already knows what he has for you next. And God knows that, but I want us to be in prayer. So I wanted you to hear from me, why we’re doing what we’re doing, and what we’re doing, in case you heard it from somewhere else, it was in the newspaper, on the news this last week, uh, but we have– there’s no financial problems, we are simply trying to do what we do, better. And so we are going through this re-evaluation processes, and it has been absolutely phenomenal. Morris puts a nice spin on events but it seems improbable that the reduction is because of growth in attendance and giving. 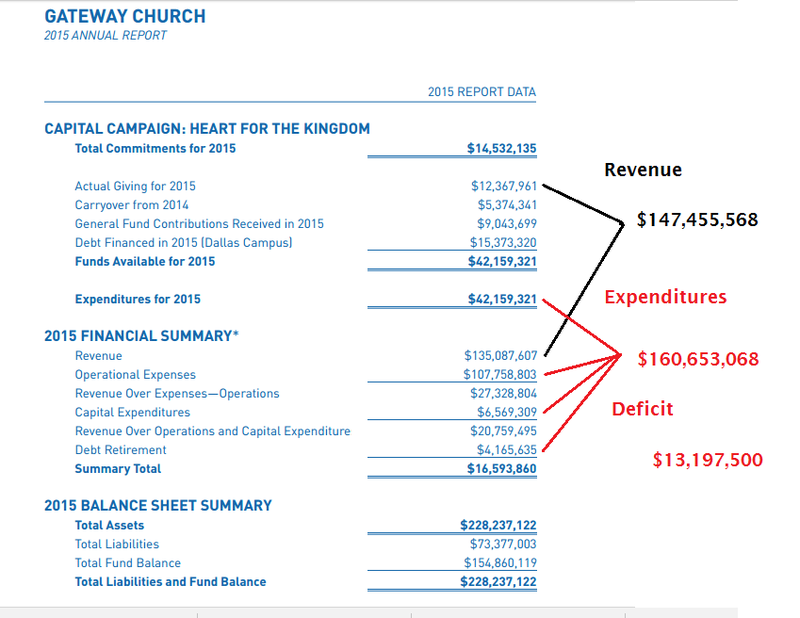 One way to look at church finances is that the church has overspent revenues by $23-million in 2015 and 2016. Morris said the elders decided to downsize last fall. So after they decided to eliminate positions and charge the youth group for pizza, they also decided to co-sponsor an expensive inaugural ball for President Trump. Morris uses a business rationale to say downsizing is due to growth (i.e., rightsizing). If Gateway was bringing in machines to take the place of humans, then one might understand how growth in revenues and efficiency might be an outcome of downsizing. Otherwise, his explanation doesn’t seem convincing. 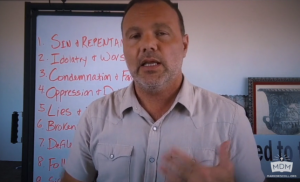 On April 6, Mars Hill Church founder Mark Driscoll claimed to Randy Robison and Sheila Walsh on the Life Today TV show that he left Mars Hill Church over a “governance” conflict which lasted eight years. At the time, I surveyed former Mars Hill Church elders and not one of them remembered it that way. 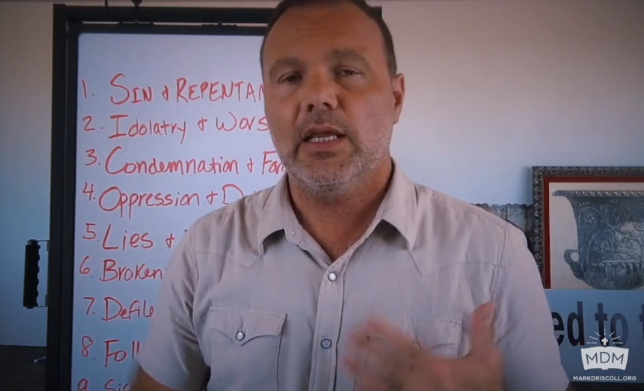 Now another Mars Hill elder has spoken out in response to Driscoll’s claim. Yesterday, former elder Mike Wilkerson said on Matt Carter’s podcast, Break it Down, that the reason Mars Hill ended was not governance but Driscoll’s coercive and abusive style of leadership. The video of Driscoll’s appearance on Life Today has been removed from the program’s website but the transcript is still available. Here is what Driscoll told Walsh and Robison about the end of Mars Hill Church. Mark: At 22 we graduated; 25 we started a Bible study trying to reach primarily young 2 college-educated singles in what was at the time among the nation’s least churched cities. In the early years we were broke and we didn’t have kids and I was working a job and didn’t think it would amount to anything. Eventually, in God’s grace, God did some remarkable things through some wonderful people. We saw about 10,000 people baptized. We saw the church grow to 15,000 on a typical Sunday. We saw 15 locations in five states, just kind of superseded all expectations. Randy: And this is the Pacific Northwest, this is not the Bible belt. Mark: No. This is urban, single, young adults, all kinds of sexual issues, confusion, abuse, baggage and carry-ons — so lots of stuff going on. We had a governance war at the church that went eight years behind the scenes over who is in charge and how things play out. At the end we had 67 elders in 15 locations in five states, a large percentage of whom I had never met. They wanted to have independent local churches and we were one large church in many locations. So there was an eight-year battle that finally went public the last year and it was very painful for everyone involved, especially the wonderful, dear, generous, amazing people that served and gave and made it all happen. So the governing board in authority over me invited us to continue and we prayed about it and talked about it as a family and felt like we heard from the Lord and I resigned. And left without — didn’t have an opportunity to say good-bye to the people so I want to let them know how much I love them and appreciate them and wish I would have had that opportunity. We took some time off just to heal up. I signed a non-disclosure agreement so you’re not going to talk about it, which was fair and reasonable and I agree with. And just decided to spend time as a family to heal up, to meet with wise counsel, to learn what we could learn and to see what the Lord had for the next season of our life. Now go here and listen at 32:31 into the podcast to Carter ask Wilkerson if Driscoll’s recent statements on Life Today were accurate. The following is a transcript from 32:31 to 34:02. Carter: A couple things, so the way that you’re describing that is, I’ll at least bring up and say that it seems to me to be at odds with what I saw Mark say on TV recently which was, which really tripped me out when he said it, yeah, there was problems there but it was an eight year governance war behind the, power struggle behind the scenes and it didn’t work out right and so God told me to leave. When he said it on there, I was like, hm, maybe I’m crazy and that’s what happened but I felt so weird like maybe I’m the crazy one because it sounded believable what he said the way he said it, but I think he, if I’m not right correct me on this, some of the stuff that you’re already discussing and whatever that is that he’s describing would largely involve you and other people. Carter: How does that strike you when you hear him say that? Carter: Do you think he thinks that’s true? Wilkerson: I don’t know. I mean I don’t know. What I can tell you that I know is there I was in 2013, early 2013 dealing with these highly escalated issues and they had to do with the bullying, kind of domineering, that kind of stuff. There was no context about governance in that. To read those formal charges, click here. As you will see, none of the issues related to governance, eight years in duration or otherwise. In the coming days, other Mars Hill Church elders may speak out. UPDATE: For photos, video and more detail, scroll to the bottom. 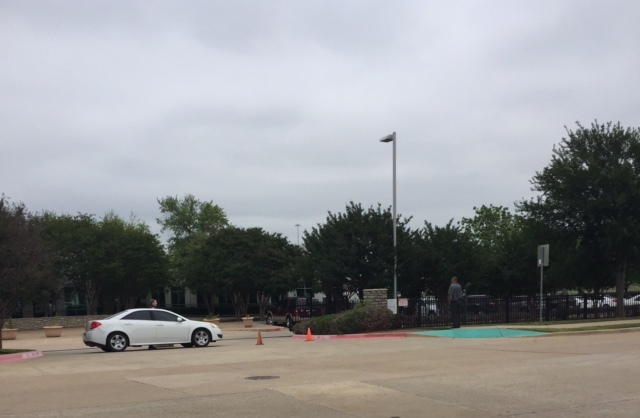 As I write this, IRS and US Postal Service agents are at the Grapevine, TX office complex of mega-evangelist Benny Hinn according to Alice Barr, reporter for NBC in Dallas. Perhaps, the agents are there to get healed. Or perhaps, they want to examine Hinn’s books. Media relations at IRS cited federal law barring disclosure and declined to confirm or deny the presence of agents at Hinn’s office. However, the agents are on the scene. A source at the scene informs me that the media crews have been at Hinn’s headquarters since 9 AM this morning. 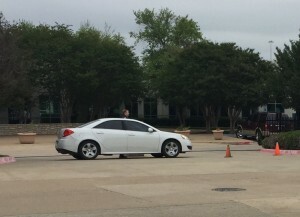 The entrance to Hinn’s headquarters is blocked off by a local police car and officer (photo below). Boxes have been coming out of the building. There are eight identical vehicles in the parking lot which the sources speculate could be from the IRS. Media crew wait for something to happen. Hinn was investigated by a Congressional committee led by Chuck Grassley in 2010. No charges were filed and no public wrongdoing was disclosed. Hinn has long been a flamboyant showman with a penchant for dramatic services and rich living. The Babylon Bee lampooned Hinn with a recent column which featured Hinn’s miracle of removing a large lump from a woman’s purse. 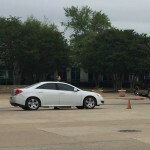 UPDATE: According to commenter GWInsida, the IRS was at Hinn’s headquarters at least until 10:30PM (4/26/17) and expected to be there for awhile longer. 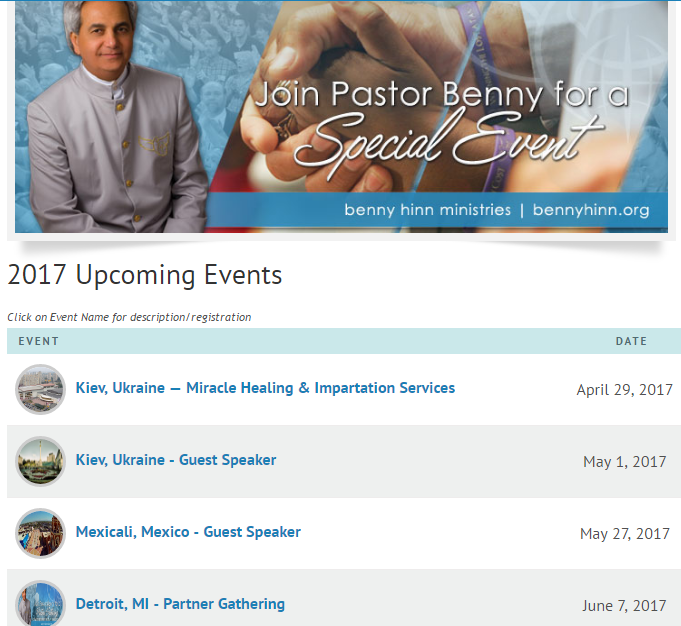 Hinn may be under scrutiny for funds collected to build a “healing center” which were never used to build anything. I hope this investigation will lead to policy changes. I think Christian ministries which take in over $1 million dollars should be required to file 990 forms just as other non-profits do. They also should be required to provide audited financial statements to all donors. If the church will not (and it has shown it can’t) police itself, then there are governmental mechanisms already in place which would help provide accountability and transparency. I kid you not. Corey Stewart a GOP candidate for Virginia governor compared the removal of the white supremacist Liberty Place Monument in New Orleans to the destruction of antiquities carried out by ISIS. United States troops took over the state government and reinstated the usurpers but the national election November 1876 recognized white supremacy in the South and gave us our state. Woodbridge, VA – Republican gubernatorial candidate Corey Stewart released a statement on the removal of confederate monuments deemed “racist” in New Orleans. Well, call me a weak-chinned Republican. Stewart supported Trump in the last election and reflects him well. New Orleans is doing the right thing and I hope more monuments to racism come down. Knowing of your desire to offer truthful and accurate information to the public, we the undersigned Christian historians and social scientists request that you remove the video titled “U.S. Capitol Tour with David Barton” at this URL (http://www.youtube.com/watch?v=dlfEdJNn15E) from YouTube. There are many factual errors on this video which we detail in the attached summary. Given that the video has been viewed over 4 million times, it seems that the errors have been compounded among Christians who trust FRC for accurate information. Furthermore, it is apparent that pastors who go on the tour are learning false and misleading information. We can provide complete documentation for everything we present here. Given that these claims are highlighted in the video but easily disproved, we believe these errors are enough to warrant the removal of the video with appropriate explanation. We would be happy to discuss this matter further and hope that we can count on you to represent historical facts accurately. Since the video was actually posted to the account of FRC VP Kenyn Cureton, he replied by saying Barton had agreed to correct the errors with new content. While this was not ideal, we waited to see what would happen. In May 2013, after a follow up request from the historians to remove the video, Rev. Cureton made the video private thus removing it from public view. He told our spokesman Michael Coulter that FRC decided to make the video private so that no one could see “the erroneous material.” However, FRC declined to inform the public or provide an explanation for the removal. Eventually, Barton posted an altered version on his YouTube account without comment. I say altered and not corrected because the video was only a partial correction, the video still contains factual errors. The alteration was done in such a way as to make it seem like the video was never changed. In summary, FRC acknowledged that David Barton was aware of his historical fiction and tried to alter the video without public acknowledgement of the errors and effort at correction. FRC leaders were aware of the many errors and did not alert their constituents to the false information. Despite this history, FRC will again feature Barton as a Capitol tour leader and speaker at their Watchmen on the Wall event in May. If anything, the situation has worsened since 2013. Since then, David Barton has falsely claimed to have an earned PhD, only to go silent about the claim when it was revealed that the degree in question came from diploma mill Life Christian University. Barton never attended the school and was simply given the degree in the way an honorary degree is given. 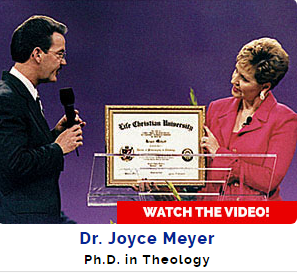 In academia, falsely claiming an earned doctorate is considered fraud. When I asked FRC’s Cureton if he was aware of this fraudulent claim, he referred me to media relations. I have heard nothing back from that department. Sadly, that pastor was right. He had been lied to. What he didn’t know is that the falsehoods were coming from his hosts and their featured speaker. That pastor might still think Congress printed the first English Bible in America for the use of schools. He might still think 29 out of 56 signers of the Declaration had Bible school degrees or that Thomas Jefferson ordered the marine band to play for worship services in the Capitol. If ever he learns the truth, I wonder if he will be even more angry at those who misled him. FRC should think about this before they host more historical fiction for a new group of pastors. 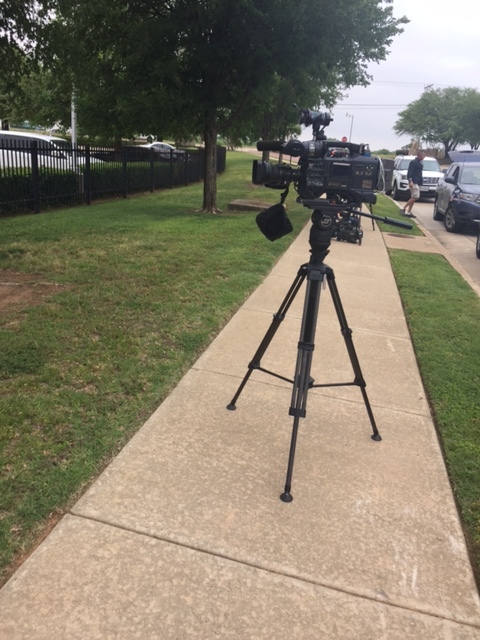 On Tuesday, I reported that Dallas-Fort Worth megachurch Gateway Church is laying off staff while spending millions on undisclosed non-operating expenses. In addition, the fourth largest church in America may have spent millions more than revenues for the second year in a row. According to former Big 4 accounting firm auditor Jason Watkins, Gateway’s expenditures have exceeded revenues by nearly $23-million. The image below was supplied by Watkins. You can read Gateway’s annual reports for 2012, 2013, 2014, 2015, 2016 by clicking the links. However, the losses are not apparent at first glance. Watkins told me that the format of the annual reports obscures the true picture. The image below compares actual revenues and expenses. 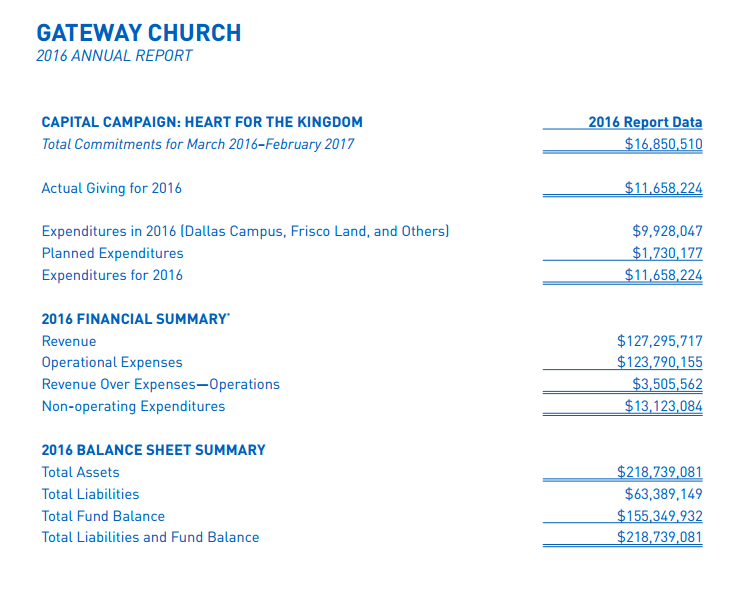 Total revenue for 2015 includes the actual giving to the Heart for the Kingdom campaign and general fund revenue ($147,455,568). Expenses include the Heart for the Kingdom expenses, operational expenses, capital expenditures and debt retirement ($160,653,068). 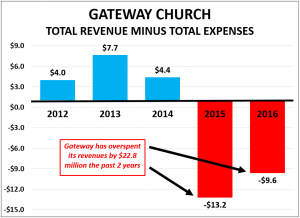 According to Watkins, Gateway spent just under $13.2-million more than the church took in. In 2016, the church spent $9.6-million more than revenues. In the image below, compare the “non-operating expenditures” line ($13,123,084) with the “revenue over expenses – operational” line ($3,505,562). The difference is a loss of $9,617,522 for 2016. With the previous year’s deficit, Gateway has spent nearly $23-million more than received, according to Watkins. Since there is so little detail in the report and since Gateway has declined to respond to questions, it is not possible for me to be dogmatic about the financial picture. However, I think Watkins makes a good case that Gateway’s spending has exceeded what members have supplied. His conclusions seem quite consistent with what Gateway’s spokesman Lawrence Swicegood told the Star-Telegram about cuts in both staff and expenses. 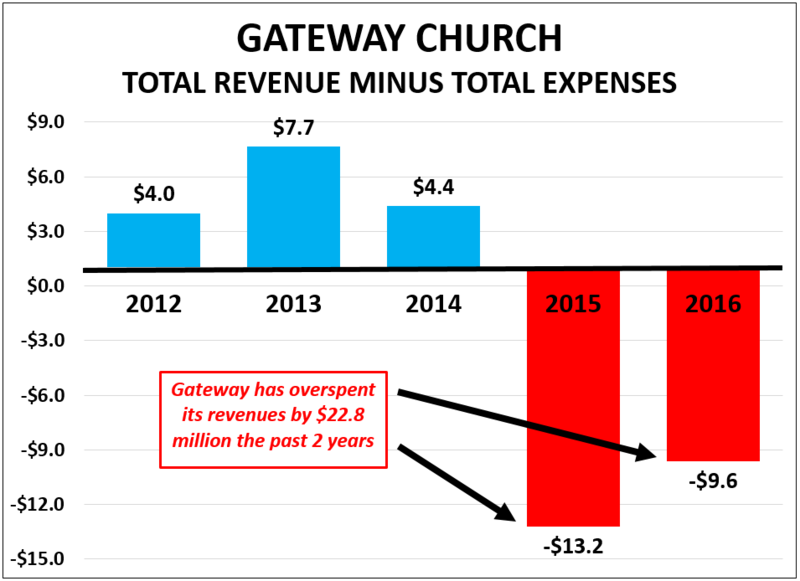 Gateway wouldn’t be the first church to cut staff and expenses but the situation is noteworthy for at least two reasons. One, the size of the cut back is substantial — as many as one-third of 900 positions. Two, the lead pastor of Gateway Robert Morris is famous for his teachings about tithing and the promises that tithing will bring prosperity and success. Since the members have no input into how money is spent, the responsibility falls squarely on the leaders at Gateway.